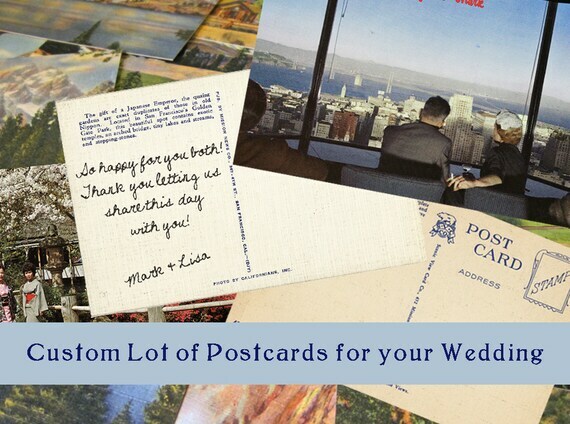 Something new that I've noticed in the last few years is that couple's are trading traditional wedding guest books for unused vintage postcards. Most often they are used in place of guest books, but I've also seen them used as place cards and RSVP cards, too. I think it's an awesome idea and such a fun way to use vintage postcards. A few days ago I got an email on Etsy from someone looking for vintage postcards for her wedding. Through my postcard club I do have access to lots of postcards. She told me the regions she wants and I'm going to gather them for her. I don't know why it never occured to me to offer this on Etsy before, but now I have a listing! It's really just a placeholder to get people's attentions, since every order will be different. If you're looking for a large lot of vintage postcards, email or contact me on Etsy and let me know how many you need, the regions and your due date. Ideally I'd have a couple months notice to get them all together and to you. I've started a Pinterest board with lots of vintage postcard wedding inspiration. 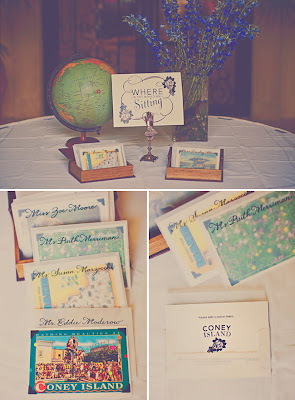 Here's a pretty image of vintage postcards being used as place cards. So many things that you can do with vintage postcards! I'll leave you with this great pin from a couple who used them for their RSVP cards. I'm so glad people are using and appreciating the vintage postcards! If you are getting married soon, Congratulations! I wasn't aware people did this, but it's a great idea.